Pat Bradley is a screenwriter and script consultant hailing from Queens, New York, which IS the linguistic diversity capital of the world. Unfortunately, he never took advantage of this, butchering every language possible. As a child, his family moved from town to town and state to state affording Patrick the luxury of being forced to dive into his imagination during cross-country road trips; all while writing and expanding on stories that he, his mother and brother came up with along the way. After the universe decided to halt his growth at the average height of a woman, Pat gave up on his dreams of being a professional athlete; opting to pursue writing and the wonderful life of a starving artist as a career instead. Quickly realizing that he enjoyed food too much, he got a job; each of which he spent more time handwriting music and stories than working. Not realizing it at the time, a chance encounter at a Queens deli with hip-hop icon Jam Master Jay in 2000 changed his life forever. During this encounter, Pat talked himself into a studio assistant job, which he immediately turned into songwriting for hire gig. Under the tutelage of Jason Mizell, he quickly learned how to organize his thoughts, words, emotions and concepts into a professional structure. A fast learner and needing to say more in his work, Patrick started his visual writing career with music video treatments for artists that were recording in the studio he frequented. Through the advice of his then-mentor coupled with having a long-winded style of writing and a hatred for limits, Pat felt it was time to turn from song and video writing to screenplays. Since then, he has been a for-hire script consultant working with everyone from Oscar winning producers to start-up production companies and everyone in between. Digging himself into a deep creative rut, he decided it was time to start producing his own work for public consumption. In December of 2015, almost 15 years after Jason Mizell planted the seed by telling him, “You’re too stubborn to write other people's music for a living, start looking to write your own movies," Patrick started a film production company, “Always Write Productions”. They would produce their first short film “Addicts Abuse” in April of 2016 and their first feature film, 2018’s “Into the Valli." Patrick is an avid sports fan and participant; he currently lives on Long Island, New York with his longtime girlfriend and two dogs. Nick Buscarino is a Long Island native, returning to New York after studying Screenwriting while attending Massachusetts College of Liberal Arts in North Adams, MA. Nick started as a prose writer, later focusing exclusively on scripts and short film production. His most recent script, Weight of the Pen, serves as commentary to a hostilely changing social platform. Founder of Lead Based Productions, this is their first feature film production. Christopher S Lind is an up and coming Cinematographer from Waldwick, NJ. At the age of 25, Christopher has already worked with top of the line independent productions. From star filled Feature films to top of the line fashion & commercial companies. He also served 5 years as Vice Chairman for the Hoboken International Film Festival. Brian Alan Dors is a New York Native who grew up in the Hudson Valley. After winning SkillsUSA, he moved to Los Angeles for his studies in film and television. He worked as an Assistant Editor and Editor for various feature films and television shows. He then took an absence from the industry to serve in the United States Army Infantry. After being honorably discharged as a Sergeant, he moved back to New York and married his college sweetheart. Brian, and his wife Rachel, now reside in New York City. Brian is an avid sportsman, whom loves the outdoors and is a certified Rescue Diver. Warren Hibbert is an audio engineer, sound designer and composer. He has worked in studios across the country on a wide variety of productions. 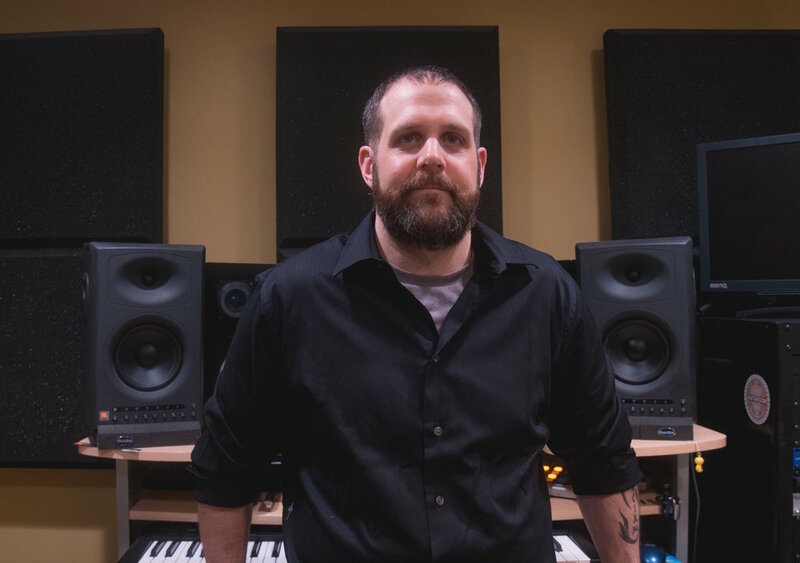 Although his main focus was music for many years , working with grammy winning artists and producers such as Gloria Gaynor, Elliot Randall and Ron Haffkine, he has since moved toward audio post production for film and TV. Currently, he is the senior staff engineer at a NYC post production facility and continues to mix lots of great independent films on the side. A freelance photographer based in Long Island and New York City, Justin’s work consists of cinematic portraits of his family situations, which include everyday moments of their lives. Justin’s work provides evidence that all humans need to feel loved and appreciated throughout their lifetime. Using a cinematic approach to photography, he allows the viewer to have this intimate connection to his subjects. He uses a mixture ambient and strobe lighting to create dramatic scenes so the viewer feels like they are watching those moments caught by his camera. Justin will continue to use his camera as a tool to unmask the human desire to connect, to belong, and to be appreciated. Justin currently lives in Long Island, recently graduating from The Fashion Institute of Technology with a BFA in Photography and Art History. He currently interns at the Soho Photo gallery. Stephanie Zuccaro has been playing the piano since age 11 and composing music since age 14She received a B.S. in Music Composition from Hofstra University in 2015. From 2014-2016, Stephanie has composed original scores for ten independent films. Spare Change (2014) was nominated at the Long Island International Film Expo, along with Leaving (2014). Leaving won best short at the Atlantic City Cinefest in October 2015 while also racking up nominations at the SoHo International Film Festival, Golden Door Film Festival, Northeast Film Festival and many more. Stephanie has been teaching piano for over 8 years, developing a new piano curriculum, focusing on learning piano through the fundamentals of songwriting & production- a new and innovative approach to piano lessons. Brandon Sargeant, (Sound Recordist for Into the Valli) is a filmmaker specializing primarily in DSLR photography, videography and non-linear editing. His body of work is comprised of independent, documentary and narrative projects along with corporate work, music videos and event coverage. He is currently working as a camera assistant on a nature film slated for release in IMAX theatres. Mike DiLorenzo is a skilled gaffer, grip, camera operator, and A.C. Since graduating William Paterson University in 2011, his skills have lead to work on numerous feature length and short films, music videos, concerts, and commercials. Currently, Mike works for NJ-based escape room business Trap Door, filming video content for all of the elaborate traps and clues that players utilize to escape. Established hair and make-up artist, Iventt Gonzalez has impacted the industry over the past 3 years. Overcoming the country's economic instability he has restarted and changed his life becoming a well rounded and humble artist, entrepreneur and community activist. Has represented many well-known companies and is now entering the film industry bringing characters to life and my Inner actor out to play. You can catch Iventt’s on-screen debut as Ronnie in Pat Bradley and Nick Buscarino’s Into the Valli (2017). As a hair and makeup artist, Julian used his passion in the beauty industry to develop the love of his craft. Born and raised in Massapequa Long Island, Julian is self-taught and now studies under reputable artists to help perfect his craft. Never giving up his hunger to become an inspiration to making a difference for others, he has given back to his community, and empowering individuals of all ages. He honed his craft by making a name for himself with hard work and determination. He never stops learning and continues to pursue his dream in the beauty industry; making an impact and inspiring others to follow their dreams.